Justice Shelton-Mosley is a weapon as a returner. Harvard football coach Tim Murphy is entering his 25th season at the helm of the Crimson. Last year, his team lost more than three games for the first time since 2000, going 5-5 in a competitive Ivy League. Harvard’s primary conference rival, Yale, looms in the final week of the regular season, with the teams set to clash at Fenway Park for the first time. The Crimson will open the season at home against San Diego Saturday. 1. How far can the offensive line take them? Murphy goes by the mantra, “It’s what’s up front that counts,” and he is in a favorable position with four returning starters on the offensive line. Heading the bunch is right guard Larry Allen III, son of the Dallas Cowboys great, who projects as a future pro despite missing all of 2017 for undisclosed reasons. Left tackle Tim O’Brien is equally imposing, protecting the blind side with his 6-foot-7-inch frame. Senior center Ben Shoults is plenty capable. Harvard’s running backs should expect to enjoy sizable holes all season. 2. Who will emerge from a glut of talent at the skill positions? Harvard boasts two preseason All-Americans: Allen and wide receiver/return specialist Justice Shelton-Mosley. The latter is a dynamic force who averaged 110.7 all-purpose yards per game last season and was an FCS first-team All-American. His 19-yard punt-return average as a freshman is in the Harvard record books. The offensive backfield is stacked. Charlie Booker was the primary run option in 2017, collecting 733 yards and six touchdowns. 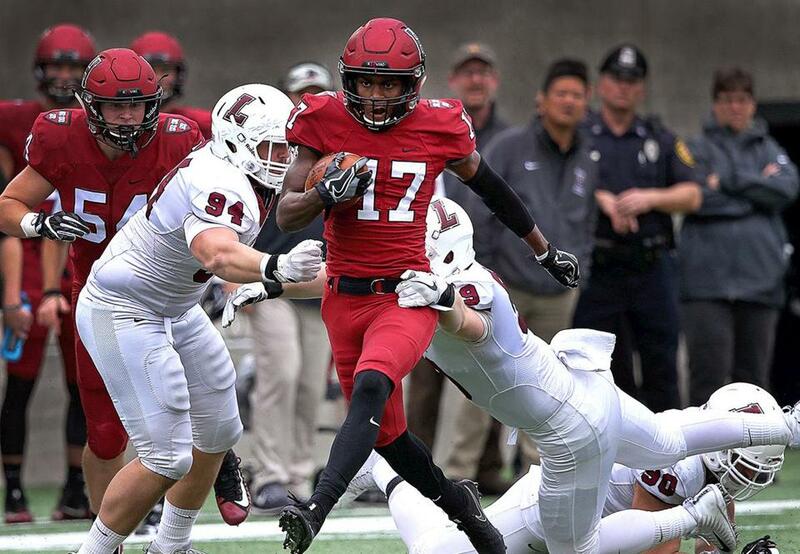 Senior Semar Smith returns after missing last season with a foot injury, giving Harvard a multitude of options, especially in red-zone situations. 3. Is quarterback Jake Smith ready to make the sophomore leap? 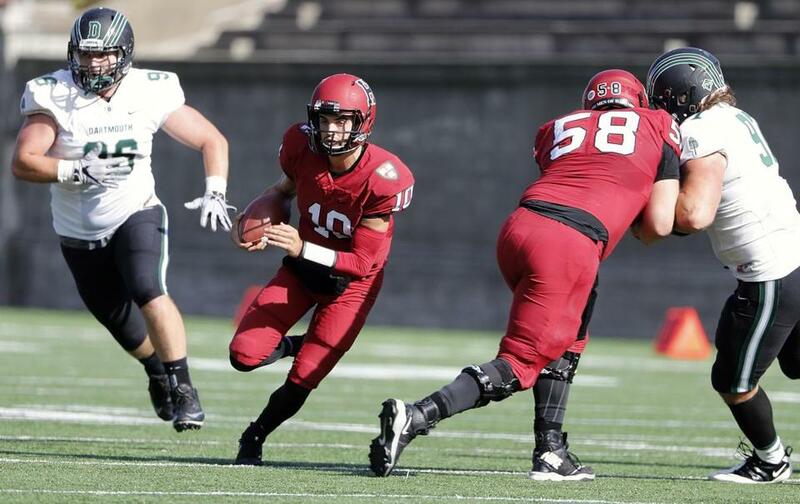 Smith was the first freshman to start at QB for the Crimson since 2001. There was a learning curve, as he exhibited promising signs but struggled to maintain consistency. Most comfortable in the spread offense, Smith failed to fully utilize Shelton-Mosley, who averaged just 3.6 receptions per game after snaring 6.0 in 2016. Smith by no means has a stranglehold on the position; he must impress in September or risk being shuttled to the bench in favor of freshman Pat Holly or senior Tom Stewart. The former was 16-1 as a starter at The Hun School of Princeton and set school marks for completions, passing yards, and passing TDs in a career. The latter didn’t see game action in 2017 but has the experience to step in if needed. Jake Smith (center) gets a block from Ben Shoults (right) against Dartmouth. “[Smith] finished the year as No. 1, albeit as a freshman; he finished the spring as No. 1, and he finished the preseason No. 1,” Murphy said. “Not that there wasn’t competition. Tom Stewart had an outstanding camp. 4. Will the front seven apply consistent pressure? “It’s what’s up front that matters” doesn’t apply only to offense. Harvard ranked 29th on defense in FCS last season, allowing 20.9 points per game. Much of the stinginess can be attributed to a formidable front seven that returns much in the way of top-tier talent. Good luck running against the Crimson, with defensive tackles Stone Hart and Richie Ryan plugging gaps in the trenches. Senior linebacker Charlie Walker (50 tackles, two interceptions in 2017) is a force in the middle. (He also has arguably the best head of hair on the roster.) If Harvard can get to opposing quarterbacks as well as it stuffs the run, this unit should be among the Ivy League’s best. 5. How much playing time will the hometown talent earn? Harvard recruits all over the country, but keeps an eye trained on Massachusetts. Two former BC High standouts, running back Danny Abraham and offensive lineman Tom Aicardi, nabbed Globe All-Scholastic honors for their excellence in high school. But with Harvard deep at their positions, it will be difficult for either to crack the rotation as freshmen. A former multisport standout at Duxbury, tight end Ryan Reagan hopes to see the field more as a sophomore after playing in three games and making three catches in 2017. Junior offensive lineman Liam Shanahan of Marlborough appeared in 10 games last season and provides depth up front should injuries become a factor. Craig Larson of the Globe staff contributed to this report. Owen Pence can be reached at owen.pence@globe.com.